Why use a stone jig for implant supported zirconia restorations? The use of zirconia has become widespread in the restoration of both natural teeth and dental implants. Zirconia possesses many ideal characteristics desired for an ideal restorative material. However, it is very unforgiving. 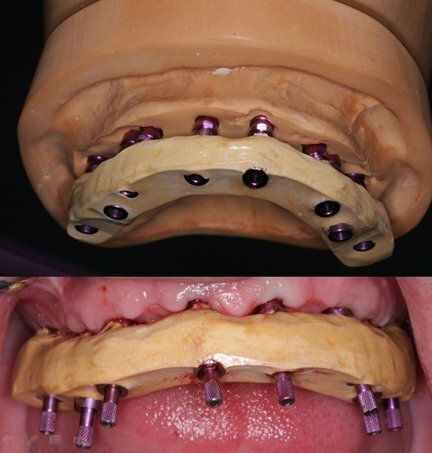 Traditionally, verification jigs were made to test the accuracy of implant master casts compared to the mouth. These jigs were made of Duralay, GC pattern resin or light cured materials. Unfortunately, these materials allow for “stretching” and micro-distortion during placement of the jig. Passivity of a large implant framework is critical and a jig enables the assessment of passivity. However, many cases restored at the implant level are subgingival and difficult to verify. Hand tightening can be deceiving with a resin jig due to its ability to flex and distort during slow hand seating. A stone verification jig is extremely sensitive to hand torqueing and will crack if the jig is not passive. This is a critical evaluation step in the verification of an implant master cast for an implant level or abutment level screw retained zirconia restorations. The stone tells no lies and will train you to be extremely in tune and sensitive to jig fit and misfit. This will ensure a passive seating zirconia prosthesis and minimize its possible cracking during torqueing.